Why (when) do you need an automatic dog feeder? Automatic dog feeders are becoming increasingly popular and many dog owners are getting them because they are practical and serve their main purpose really well. Work and social life do not always allow us to commit to our dearest companions as much as we would like to and should, therefore, a solid automatic dog feeder will help you a great deal to meet the necessary dietary requirements of your pet. Bear in mind, however, that these devices are not intended to replace your care and attention to your dog’s diet completely – the purpose is to serve as a great assistance in your absence when you cannot commit to regular manual feeding. We encourage you to also read our article about scheduled dog feeding. If you want to get informed more about which automatic feeder for dogs is the best for your individual fella, make sure you read on about the following types of automatic dog feeders that match your lifestyle and preferences. 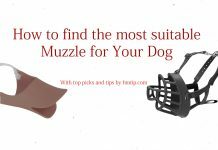 Note that these devices can be used for cats too, therefore, although we mainly focus on the convenience of the dog in this article, you can regard these as automatic cat feeder reviews as well (see for the individual review for more details). What to look for in a new automatic pet feeder? PetSafe Healthy Pet Simply Feed Automatic Feeder is an auto dog feeder that is pleasantly simple to use, convenient, and that can easily feed your dog. The dimensions are the following: 18.5 x 8.7 x 12.4 inches, and it weighs just a bit over six pounds. What is great about this automatic dog feeder with timer is that you can program it to give your dog the meal in exact portion, size and schedule that you have previously set. This auto dog feeder is using a conveyor belt for providing accurate portions of foods. You can easily customize the dog`s food portions as you wish. Another magnificent feature is a slow feed option which dispenses food (dry and semi-moist) on every fifteen minutes so your dog will not gulp, bloat, or vomit. The bowl is made of stainless steel, and it can be very easily cleaned. The option for controlling the portions and the timer makes it very easy for you to keep track and properly manage the weight of your dog. Furthermore, this can be used for a domestic cat as well. Overall, there are many good reasons behind why this is the best-seller in its category and makes all the to pick No. 1 in our list. HM tip: We recommend going for our top choice unless you absolutely want a smartphone connection to it. Otherwise, the overall quality and features really are top-notch making it also one of the best automatic cat feeder available in the market. 10.6 x 8.3 x 15.9 inches, which makes it suitable to put on any place in your home or in the yard. This automatic feeder for dogs and other pets works like a pet sitter. You can feed your pets remotely at any time or from any place. All you have to do is just set the feeding times or you can do a manual feeding by using your smartphone. The setup application is very user-friendly and easy to install. Just log on to the app and program the feeding schedule for your dog. You can control the meal portions and feeding intervals, so you can easily control the body weight and the eating habits of your dog. An important thing to have in mind regarding the SmartFeeder, which also the main drawback of this rather expensive device, is that this auto dog feeder is suitable only for dry dog food. However, the reason why many people love this automatic feeder for dogs (and cats) is that is very convenient – you can feed your dog or other pet at any place and any time. The SmartFeeder software can be downloaded for free and is compatible with all operating systems like Android, iOS, or tablets. When the auto dog feeder is not online and when it is not connected to Wi-Fi, it can automatically switch to offline feeding model, so you have nothing to worry about in this regard. Another great thing that comes with this feeder is that you can watch your dog at any time with the real-time camera installed that tracks the movement of your dog. Also, the tray structure and hopper structure of the auto dog feeder are both detachable, while the camera has hundred thousand pixels for top quality transmission. HM tip: Consider this the best outdoor automatic dog feeder if you are looking for a feeder device with a smartphone connection to it. If you are on a stricter budget, but still seek to get one of the top automatic dog feeders, then you should consider getting PetSafe Automatic Pet Feeder which is a significantly cheaper counterpart to our first pick from the same manufacturer. The dimensions of this product are 15 x 5 x 18 inches and it weighs just over three pounds. This automatic dog feeder with timer has a digital display with easy to use settings. There are five one cup chambers for storing dry food, and you can customize the portions as you wish. 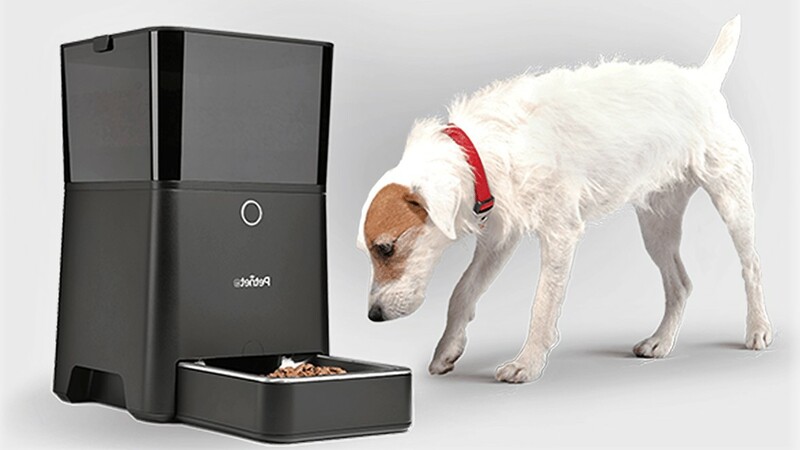 The food tray can be easily removed and washed in a dishwasher, while the auto dog feeder operates with four D batteries that are not included in the packaging. The timer makes it very easy for you to program the feeding times for your dog for up to five meals per day. 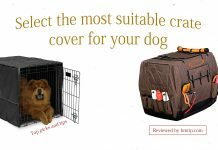 This is ideal if you want to control the weight of your dog, or for feeding the dog while you are traveling somewhere. Just like the other top automatic feeders in the top, this one is applicable for cats as well. HM tip: Consider this a great inexpensive alternative if a smartphone connection isn’t a must. For the price you pay, it’s definitely the best in its category available in the market. Another quality outdoor automatic dog feeder for a good price is the Aspen Pet Lebistro Programmable Food Dispenser. The weight of this product is about four pounds and its dimensions are 9.8 x 14.4 x 13.9 inches. The programming of meals is done very simply and easily. The built-in meal counter and the large LCD screen are top features of this auto dog feeder, while there is also a quality lid for keeping the food always fresh and secure. Food bowl can be easily removed for cleaning, while the top shelf can be washed in a dishwasher. The stand and the locking bowl both provide great stability and prevent the food from spilling. It has a unique design, and the portions can be easily controlled – it can be programmed to dispense meals up to three times per day (although still might be enough for most, that is significantly less than its previous counterparts in the list). The programming of meals is done very simply and easily. The built-in meal counter and the large LCD screen are top features of this auto dog feeder, while there is also a quality lid for keeping the food always fresh and secure. Food bowl can be easily removed for cleaning, while the top shelf can be washed in a dishwasher. The stand and the locking bowl both provide great stability and prevent the food from spilling. The system works automatically and dispenses the pre-programmed food portions. You do not have to have some special knowledge to program the system because everything is done easily like you are setting a simple alarm clock. On the LCD screen, you can check the number of meals programmed, time of feed, sizes of meals, and how many meals are served. The dispenser is great for storing various shapes, sizes, and types of dry dog food. The hopper is removable and can be easily refilled and cleaned. This auto dog feeder requires 3 D batteries to operate, and the batteries can last for up to six months before replacing them with new ones (which is half the life for 4 D batteries used in our pick No. 3). HM tip: Another solid and less expensive alternative compared to our first two pricier picks. Compare the features we mentioned with the third pick and see what works best for you. How to adapt your dog to using automatic feeders? If this is your first time buying an automatic feeder for dogs, then you may need some time to prepare your dogs for using it. Some dogs and other pets may need a certain period of adjustment in order to get used to using the automatic dog feeders. However, by following some helpful advice you can help your dogs easily transition towards using the new auto dog feeder. First advice is to put your new food dispenser right next to the current dog feeder or bowl of your dog. Then, put some food in the new food bowl so the dog can get familiar and adjust to the new dog feeder. As soon as you notice that your dog has started eating directly from the new one, you can remove their old food bowl or feeder. Have in mind that the adjustment period is different for different types of dogs and pets. Some dogs can get used to their new automatic dog feeders in a day or two, but some dogs may need a few weeks before they transition completely towards using their new feeders. All of the mentioned automatic dog feeders will serve their main purpose well, so you will not make a mistake if you opt-in for some of the mentioned models. The modern technology has entered in all fields of life, so now even dogs can experience all the good benefits that come from the modern technology. All of these machines are easily programmable and can follow your instructions. Leaving your pets at home does not have to be stressful because your pets will be well fed at all times. The camera options on some of the dog feeders is another great feature through which you can observe your dog`s eating habits no matter where you are located. Compare the models, see what will work best for your companion and lifestyle, and make your choice so that both you and your dog can be satisfied and fully enjoy the new auto dog feeder.